Here at Columbia Brothers Power Washing we treat our customers like neighbors, and our neighbors like family- giving you are absolute best. Our goal is to continue providing 5 star rated services to all of our loyal clients here in Columbia Maryland. With our gutter cleaning techniques we will manually clean, rinse and flush debris and sediment from your gutters and downspouts, and then remove all roof and gutter debris from your property. We take pride in our work and our customer service. In addition to being fully insured, we offer the best gutter cleaning methods and soft wash in Columbia Maryland– all services are environmentally safe and use high quality cleaning solutions. Give us a call today to schedule your free estimate! As a hardworking company we are committed to providing consistently reliable service in a timely and professional manner. Our gutter cleaners are professionally trained, highly skilled and courteous. What sets us apart from other gutter cleaning companies, is we actually enjoy what we do, and are dedicated to serving our customers. Give us a call or fill out a contact form to set up your free estimate! 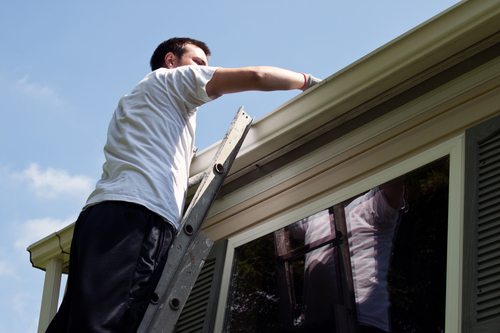 Gutter cleaning is extremely vital for the health and durability of your roof. Branches, Leaves, and dirt create blockages that prevent rainwater from draining off your roof correctly. This can cause damage to your roof, siding, basement, foundation, and landscaping. Avoid these problems by making Columbia Brothers Power Washing your premier cleaners in Maryland. Gutter cleaning is a dangerous and dirty job, let our professionally trained and experienced cleaners do it for you. We use the right tools, equipment, and techniques to remove blockage and keep rainwater flowing freely through your gutter system. Any time you have overflow from your gutters you should have your gutters and downspouts cleaned to prevent water intrusion from damaging your home and leaving you with costly repairs. For preventative, on-going maintenance, if you have many trees surrounding your roof, our expert recommendation is that you should clean your gutters at least twice a year. As the #1 Rated Gutter Cleaners in Columbia Maryland, we understand that the quality of our work reflects on your property, which is why we strive to do things right at all times. We pledge to all of our customers that you can count on our knowledge, expertise, and experience in the industry. Our gutter cleaning experts have seen it all, and are ready for any task given. If you are in need of home or commercial pressure washing, graffiti removal services, or roof cleaning, contact us for a free estimate. This company is punctual, and does great services!!! Columbia brothers power washing was at my home cleaning my windows when they asked me about my gutters, when i realized my gutters haven't been cleaned out for years i scheduled a cleaning! Thank you for reminding me to clean them! This company is lovely. They removed the leaves and dirt from my gutters and then made sure they flowed properly. All for an affordable price! I didn't realize how clogged my gutters were until you offered to check! Im so happy you did! Thanks for the great service. These guys saved my home from further damage, all due to overflowing dirty gutters. Thanks for the amazing service! I highly recommend columbia brothers power washing! 5 star company & Friendly Customer Service! I am very pleased with this company. They showed up on time, did an amazing job, and even cleaned up after themselves! Will be using them in the future.